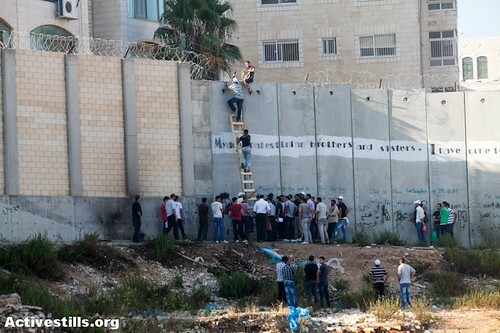 This is a great photo by ActiveStills, posted on this, the last Friday in Ramadan 2012, here. Unusually, this year, because of the way the calendar fell, Ramadan has five Fridays this year — and today is the most important. But, these improved rules still say that only Palestinians under 16 years of age, or over 40 years of age, will be permitted to enter Jerusalem on the Fridays in Ramadan to worship. Everybody else will have to try to apply for a permit — and that is almost impossible to obtain. So, for the young men shown in this photo, they have no real prospect of entering Jerusalem to pray at Al-Aqsa for anything up to 22 or 23 years from now! Today is the 8th anniversary of the International Court of Justice’s Advisory Opinion of the Wall — declaring it illegal, and noting that the West Bank [including East Jerusalem] is under an Israeli military occupation. The Wall is being extended in the Jerusalem area, particularly around Atarot [which Ehud Olmert reportedly offered to Mahmoud Abbas, along with Qalandia Airport, in September 2008]. Also today, on this 8th anniversary, Israeli media have reported that an Israeli committee headed by retired Israeli Supreme Court judge Edmond Levy, and appointed by Prime Minister Netanyahu to investigate the legality of building settlement outposts in the West Bank, determined that construction in the occupied territory is not illegal — because, it says, the West Bank is not occupied. It is indisputably true that, as the New York Times says the Levy Report argues, “the outposts now deemed unauthorized were established with the knowledge and encouragement of Israel’s most senior government echelons”. The Levy Committee therefore concluded that “this amounted to ‘implied agreement’.” [i.e. = implied agreement of the Israeli government and/or its senior officials]. The NYTimes piece is published here. Dahiet al-Bariid, as we’ve written before, is divided in two by Israel’s Wall. Al-Monitor’s caption for this photo reads: “Two boys walk along the wall and past an army watchtower in Dahiat Al-Barid, a West Bank neighborhood on the outskirts of Jerusalem. (photo by Sophie Claudet, Al-Monitor)”. Yes, well, this exact spot has been granted, after an appeal to Israel’s Supreme Court [an appeal filed by some of the residents of this neighborhood, led by the Christian institutions there], has been ruled to be part of “Jerusalem” [meaning, Greater Jerusalem Municipality, which was created unilaterally by Israel a few weeks after the June 1967 War by carving out a crescent of West Bank neighborhoods running in an arc from Ramallah in the north almost to Bethlehem in the south, all around the Old City of East Jerusalem]. In February 2009, six months after the IDF military watchtower which can hardly been seen in this photo was put in place [in September 2008], sealing this part of The Wall, the IDF removed the awful ar-Ram checkpoint which was down the hill, making movement much easier into Jerusalem. For the six long months between September 2008 and February 2009, there was only one way in and out, which was through the ar-Ram checkpoint, and at least 30 minutes waiting before leaving, even if only to go to the pharmacy or to buy some fresh vegetables or meat. The military watchtower [“pillbox” was installed, in a terrible slow ballet choreographed under armed guard while 3 huge round cylinders were slowly driven out of Neve Yaakov, just up the street. It was the beginning of September [and the beginning of Ramadan 2008], and some members of a family were trapped in the “New Mosque” on the Jerusalem side. The armed guards told everybody watching to “go home and watch Baab al-Hara” [a popular Syrian miniseries playing for Ramadan]. But after about an hour, they eventually relented, and opened the doors on the two sides of the cylindrical military watchtower, so the father and his daughter could all make it home. From that moment, there was no longer any direct passage to the West Bank, and to do that all traffic was redirected to the already-congested and truly terrible Qalandia Checkpint. This is the Palestinian town of Bethlehem, in the occupied West Bank. It was a unilateral decision, and a unilateral implementation of this decision. Nabil El-Araby (ElAraby) has been named the Foreign Minister of the new Egypt. Fayyad testing limits of what is "Jerusalem"
How do we know what is “Jerusalem” today? Announce that the Palestinian Authority’s Prime Minister, Salam Fayyad, himself a resident of East Jerusalem, will attend a ceremony inauguration renovated schools in various parts of East Jerusalem… After an order signed by Israel’s Ministry of Internal Security Yitzhak Aharonovitch, banning any Palestinian Authority activity inside Israeli territory, following instructions from Israeli Prime Minister Benyamin Netanyahu, Fayyad cancelled his appearance at Dahiet as-Salaam [sealed behind The Wall, beyond Shuafat Refugee Camp and Anata Village]. PA PM Salam Fayyad was testing the boundaries of “Jerusalem, and Israeli PM Netanyahu got involved. According to a report in the Jerusalem Post, Fayyad was to rededicate 2 of 15 East Jerusalem schools that “the PA secretly paid to renovated”. This was published here. The JPost report added that this news of PA schools renovations “was condemned by Israeli politicians, who accused the PA of flaunting its authority within Jerusalem”. According to this report, Israeli officials and politicians say “the PA violated Oslo Accords by renovating East Jerusalem schools”. There was also another recent report that the PA had paid [presumably using donor money] to repave some of the roads in Dahiet as-Salaam. But, Fayyad did attend the planned ceremony in Dahiet al-Bariid. The ceremony that Fayyad attended, however, was in the part of Dahiet al-Bariid that is on the “Palestinian” side of The Wall. Dahiet al-Bariid is split in two by The Wall, which runs right up the middle of Ahmad Orabi Street, separating families. But, this was done by the Army to implement a Supreme Court decision following a petition of some of the residents and institutions [though not including the World Bank, whose offices are there] closest to… well, if not all of Neve Yaakov, at least to the IDF’s Central Command (which is in Neve Yaakov). Residents and institutions told Israel’s Supreme Court that they did not want to be cut off from Jerusalem, which they said was the “center of their lives”. The Supreme Court accepted the petition, and the Israeli Army re-routed The Wall, right up the middle of the street. The status of that special triangle [ Dahiet al-Bariid on the Jerusalem side of The Wall] is yet not fully clear. At the moment it is apparently still officially a “seam zone”, according to the Commander of Qalandiya Checkpoint who was present in February 2009, after the miserable “Ar-Ram” Checkpoint was removed. The Commander said “we will let the negotiators do their work”. That, of course, could take some time. The part of Dahiet al-Bariid on the other, “Palestinian”, side of The Wall, which Fayyad visited, is now only accessible after going through or around Qalandia, and through ar-Ram. Continue reading Fayyad testing limits of what is "Jerusalem"
Posted on 2 November 2010 Author Marian HoukCategories Boundaries & Borders, Israel, Palestine & PalestiniansTags Jerusalem, Palestinian Prime Minister Salam Fayyad, The WallLeave a comment on Fayyad testing limits of what is "Jerusalem"
Lesley Stahl’s report for the CBS news program 60 Minutes was about Silwan, last Sunday, and can be viewed here, or via the Mondoweiss blog, here. Lesley Stahl’s reporting included an extra, separate, segment on Silwan’s Beit Yonathan — an illegal 7-story building, built by, and housing, Israeli settlers — which is now under demolition orders: here. “Silwan is a dangerous neighborhood. Not only because of the simmering political tensions between the Palestinians and the Jewish settlers occupying houses in the city, but also because the neighborhood is one of the centers of the drug trade. But of all the cities and villages in the West Bank, the Palestinians of Silwan have a reputation as being on the forefront of resistance to Israel’s steady takeover of Palestinian land … Silwan is located in East Jerusalem’s holy basin, which encompasses the north, east and south of the Old City. Over the past five years, the Israeli government has been encouraging Jewish settlers to settle in the holy basin..
Tamer Halaseh has written on his weblog at the end of August that “where I live in Al-Sawahra Al-Sharqiya, accompanying the deceased in their final trip is another story … After the wall was completed in our area and we were separated from our families and friends in Jabal Al-Mukabber, the Israeli occupation forces informed us that in cases of death we were to coordinate the funeral arrangements with the Israeli army so as to be allowed entrance into Jabal Al-Mukabber and reach our cemetery. This means that when someone dies from my side of the town, instead of mourning the dead and arranging for the funeral, we have to run and coordinate with the Israelis to get the needed funeral permits. Sometimes, mourning family members have to wait hours till the office of coordination opens so they can apply for permits. This is not all; as with Israeli military orders that keep changing like the weather, every time there is a funeral we discover there is a new regulation regarding the funeral permits. One time we were told that only those 45 years old and above will be allowed to pass the checkpoint and enter Jabal Al-Mukabber. Another time we were told that only very close family members such as brothers, children or grandchildren, would be allowed to pass. Yesterday, a relative and direct neighbor of ours died. When his children went to the coordination office to get the permits for the funeral, they were told that only 50 mourners would be allowed to pass to the cemetery”… Tamer’s post can be read in full here. Palestinian Prime Minister Salam Fayyad gave UN Secretary-General BAN Ki-Moon a safe and secure look at the situation on the ground in the West Bank. UNSG BAN was originally supposed to meet Palestinian President Mahmoud Abbas — but Abbas reportedly is suffering back pain following an accidental fall last week, and was advised to rest for a few days after a medical check in Amman on Friday. Instead, in Ramallah, Fayyad reportedly took BAN to the Masyoun area in Ramallah, and further west to a spot near the infamous Israeli prison, Ofer, where there are hundreds if not thousands of Palestinian detainees being held, and where there is an Israeli military court where there are hearings for some detainees. According to the Palestinian News Agency, WAFA, BAN said: “I saw with my very eyes the hardships the Palestinians face as a result of Israeli settlement activities and land confiscation”. AP reported that BAN’s tour of the situation on the ground (in a small part of the West Bank) was brief. AP added that BAN told Fayyad in Ramallah that “The Quartet has sent a clear and strong message saying that we strongly support your efforts to establish an independent, viable Palestinian state”. After seeing some of the sights, BAN gave a press conference — apparently in the Palestinian Prime Minister’s office. Many journalists were not informed — by either the UN or the Palestinian Authority information services. "The reason for walls is always fear"
Roger Waters (Pink Floyd, The Wall) has visited The Wall here — Israel’s “security barrier” — a couple of times. UN/OCHA says, in a note on Youtube explaining the film, that it “explores how Palestinians in urban and rural areas have been impacted by the Walls construction since the International Court of Justices Advisory Opinion in 2004, which declared the Wall’s route in the West Bank illegal. Several senior Israeli security officials are interviewed in the film, two of whom were directly responsible for planning the Wall route and who explain the Israeli position for constructing it. The film was made by the United Nations Jerusalem”. Part One includes some archival footage of former Israeli Prime Minister Ariel Sharon announcing in August 2002 that “We have decided to erect buffer zones to achieve a security separation. we have decided to start immediately to mark buffer zones and erecting obstacles along them”. Yes, it’s true, says General Amos Elon, identified as former Israeli Defense Ministry Head of the Security Fence Project): “we were on a very tight schedule” and “we had to solve the security problem as soon as possible”. Therefore, any determined suicide bomber could probably still get through to Israel without too much trouble. Shaul Arieli agrees that The Wall (he calls it “the fence”) does not have anything to do with the end of suicide bombings — but he says that’s because the Israeli military is catching potential bombers deep within the West Bank itself. There is a good vignette of Israeli soldiers inspecting Palestinian families who have permits to enter through a closed gate to work their lands. The film says that new UN research shows that only 20 percent of those in the northern West Bank who used to work their land which is now cut off by The Wall are getting permits — “Land becomes abandoned for lack of access”, Waters says. The film also says that over 80 percent of The Wall goes through the West Bank (i.e., is not on the “Green Line” or armistice line that served as a boundary from the time the UN negotiated agreements with four neighboring Arab countries to end the fighting that surrounded the creation of the State of Israel in 1948 until the June 1967 war when Israel captured the West Bank (and more). It suggests that this is the main reason for the July 2004 Advisory Opinion by the International Court of Justice that termed The Wall — and its associated regime — illegal. Posted on 22 February 2010 Author Marian HoukCategories Boundaries & Borders, Human Rights, International Humanitarian Law, Israel, Palestine & Palestinians, Register of damages due to The WallTags Israel, Palestinians, The Wall, UN OCHALeave a comment on "The reason for walls is always fear"